Come with a jacket that has a the traditional 3 front pockets, an inside pocket and a matching handkerchief. The waistcoat has a stripe and glitter pattern. The trousers is lined for extra comfort. Very well made, good cut and quality material. Ideal for First Holy Communion, wedding and Confirmation. 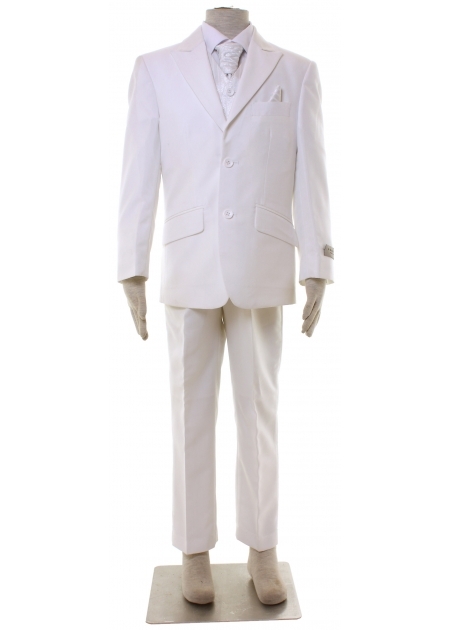 This white suit is in stock at our Ashford shop for viewing and trying on. We are a real shop on the high street in Ashford Surrey and we only sell quality suits.